HMD Global – the home of Nokia Phones, announced the launch of Nokia 6 today. It is the third Android-powered smartphone of Nokia, which will be available across all local markets in Pakistan. 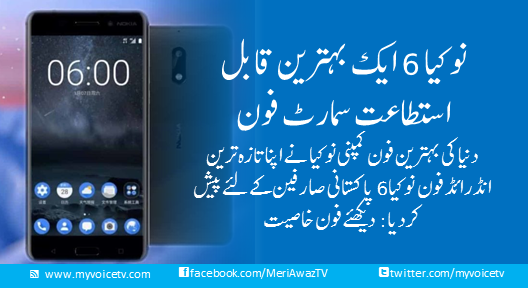 Nokia 6 is Available for Sale in Pakistan. Combining superior craftsmanship and distinctive design with an immersive audio experience and a 5.5” full HD screen, the new Nokia 6 delivers a truly premium smartphone experience. The unibody of the Nokia 6 is crafted from a single block of 6000 series aluminium and is perfect for those who want a robust phone with outstanding entertainment credentials. The smart audio amplifier with dual speakers allow consumers to experience a deep bass and unmatched clarity, whilst Dolby Atmos® sound delivers a powerfully moving entertainment experience. Headquartered in Espoo, Finland, HMD Global OY is the new home of Nokia phones and tablets. HMD designs and markets a range of smartphones and feature phones targeted at a range of consumers and price points. With a commitment to innovation and quality, HMD is the proud exclusive licensee of the Nokia brand for mobile phones and tablets. Nokia is a registered trademark of Nokia Corporation.